The rapper opened up about his experience to a group of students in LA. 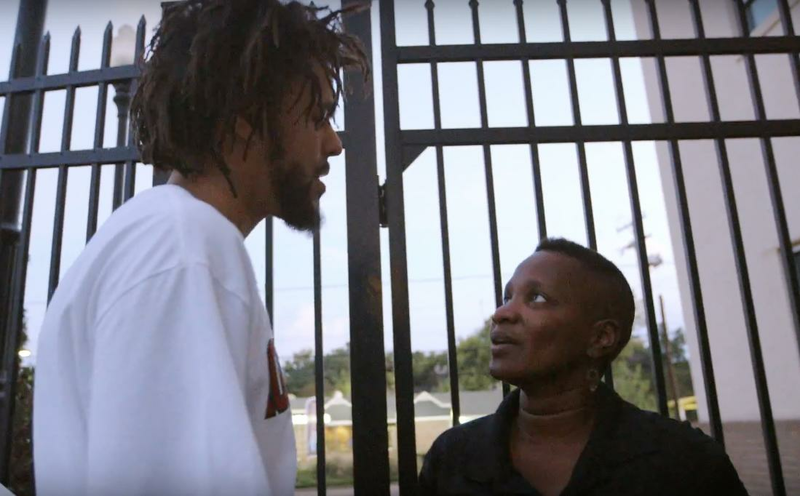 J. Cole has opened up about filming the powerful final scene from his '4 Your Eyez Only' documentary. Speaking to students at Southern University in Baton Rouge, the rapper discussed his emotional exchange with a 52-year-old black woman from that very same area. After learning that she had tragically lost both of her children, Cole was mesmerised by the woman's resilience and strength. "I'm just looking at this lady and asking her about her life, asking her about her grandkids," recalls Cole in the clip. "She was like, "He was 19-years-old. His best friend had a gun. They started arguing over the gun and they're like wrestling over the gun or something, and he got killed like that.'" The Fayetteville native recounted the moment that the woman, who juggled three jobs to support herself, told Cole her daughter was murdered. "We keep talking and then she tells me she had a daughter that was 14 that got murdered." Cole continued. "She didn't say it like it didn't mean nothing, but I didn't see no type of like bitterness or anger in this woman." The clip concludes with Cole referring to his meeting with the woman as "a blessing". J. Cole's documentary '4 Your Eyez Only' is available now to stream online in full.